In 2000, leaders from 190 countries met together and agreed on eight Millennium Development Goals (MDGs) to be achieved by 2015 to eradicate extreme poverty, reduce child mortality rates and fight epidemic diseases such as AIDS and malaria. This unit helps us explore the MDGs and learn how WE can help! This material was originally designed for a 4-day children's program with sessions in the morning and again in the afternoon. We've included all of the ideas we used, so know that you will need to choose the activities that work best with your group and time limits. Also, this resource does not follow the same seven-workshops format of the other Units in WorkshopCycles. You do not need to study the MDGs in any particular order, so feel free to move things around. Many of these ideas can easily be adapted to work for Children’s Sunday School, VBS or other special programs. We encourage you to take these ideas and adjust them to fit your group – make them your own and then share them with others. 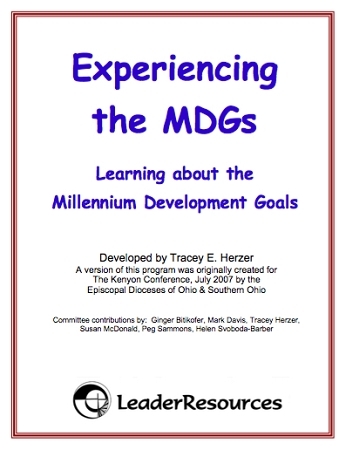 Because we believe the Millennium Development Goals (MDGs) are important, we also include another FREE unit on the MDGs written by Chris Lynn for Church of the Advent in Spartanburg, SC. Chris is one of our trainers for WorkshopCycles and her experience as a creative and well-respected Christian Educator is invaluable. You will have to adapt or substitute lessons that are either local in nature or are not included, but we think you will enjoy these bonus lessons and glean valuable ideas from her work. Enjoy!